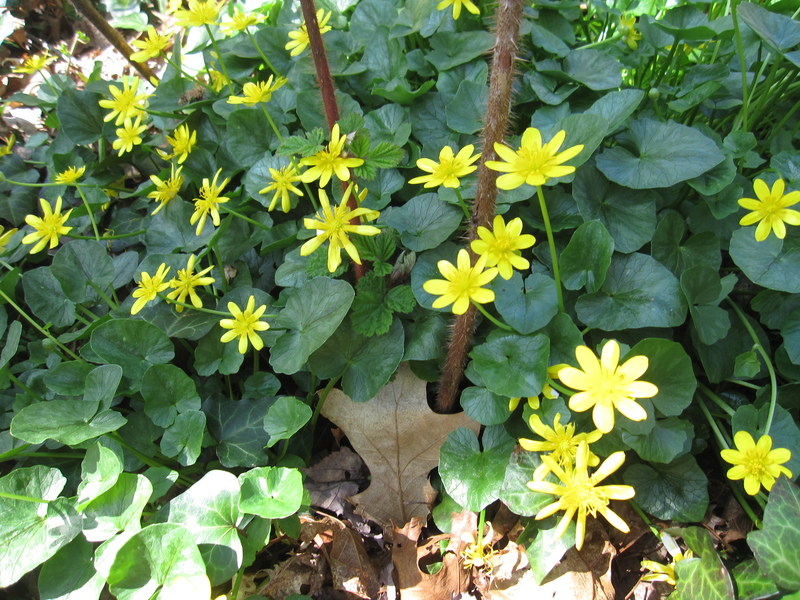 Lesser Celandine or Fig Buttercup It’s the last day of April, 2015 and beautiful 9 petal bright yellow buttercup flowers cover lawns, hill sides, stream banks, bogs and anyplace ground cover can grow. 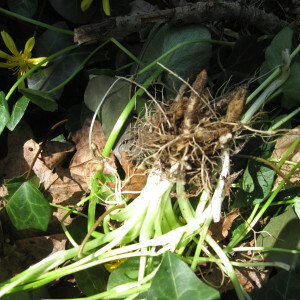 Uprooting one of the multi-stem plants reveals the cluster of tubers that identify it as fig buttercup, also known as lesser celandine — a native European invasive to Long Island. A website search discovered that this recent, fast growing plant is exploding in the Pacific Northwest and beginning to do so here in the Northeast. 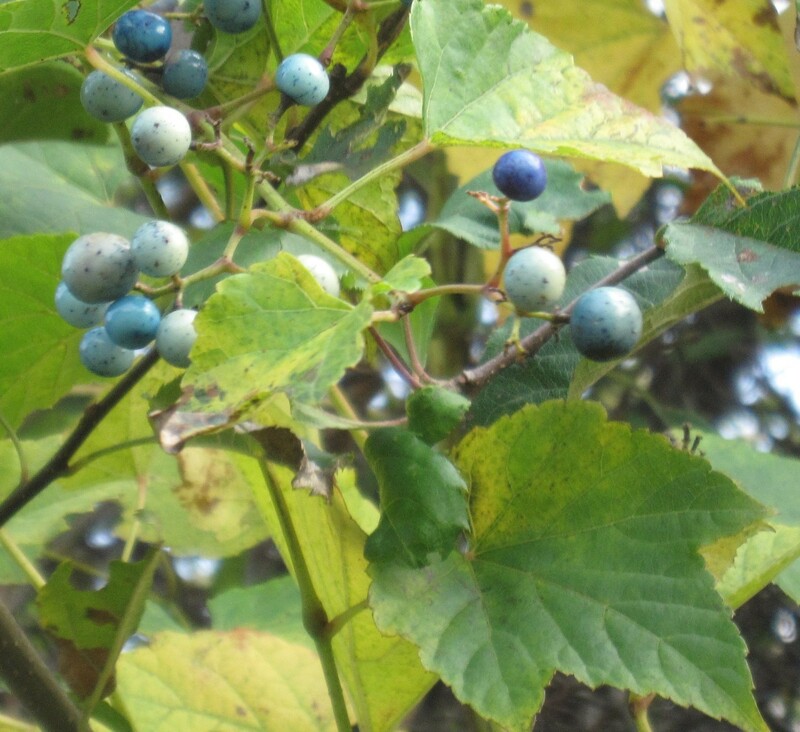 And as with many of our invasives this plant is edible. The tubers, pulled before and after the flowers bloom can be boiled, roasted, and hot pickled. 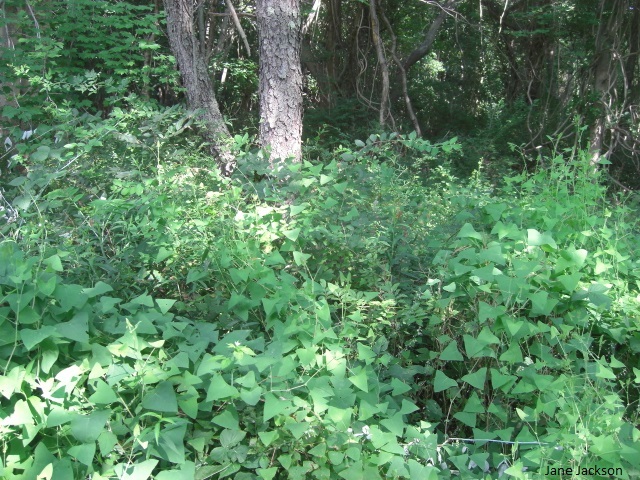 As with harvesting young invasive garlic mustard leaves, don’t be concerned about exhausting the supply. 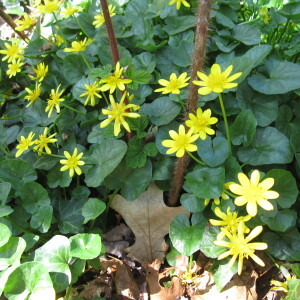 To slow the rapid growth of fig buttercup, start removing the plants as soon as they can be identified. Hand pull plants before they set seed or form bulbils. 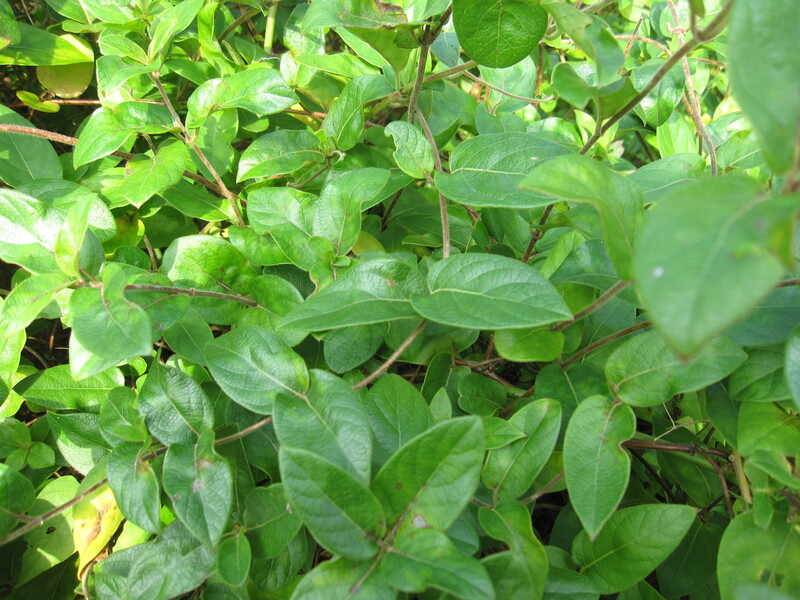 The stems of the heart shaped, wavy edged leaves, which may be solid green or with deep plum blotches, can be easily grabbed at the ground, and gently yet firmly wiggled and slowly pulled to uproot the tubers. If the ground is compact use a hand weeder garden tool. Cook or solarize the tubers to destroy them. Garlic Mustard The young sprouts of the first year’s growth remain relatively small throughout the growing season and don’t flower. 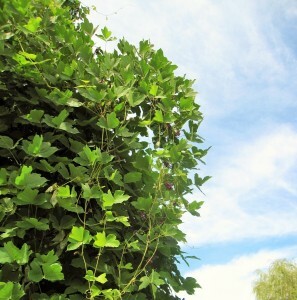 In late April/early May of the second year the plant matures with small clusters of white flowers at the top of each stalk. Uproot and leave the small first year’s seedlings on site. Uproot and solarize all other stages, beginning with the flowering stage of this plant to prevent seedpods from developing and dispersing. 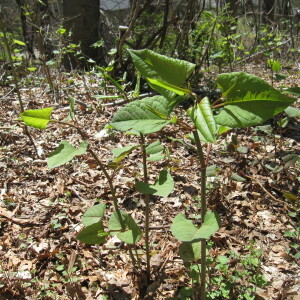 These flowering stems will continue to grow and produce seedpods — even if the entire plant is uprooted and composted or left on the ground and not destroyed. 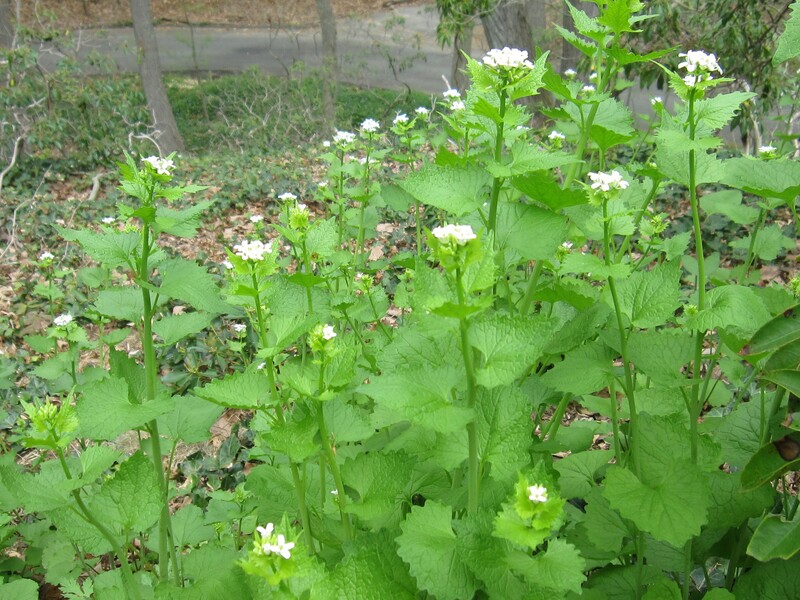 But first, because garlic mustard is edible, you may want to pinch off and cook the first year’s growth or the tender stems several inches below the young flowers in the plant’s second year. 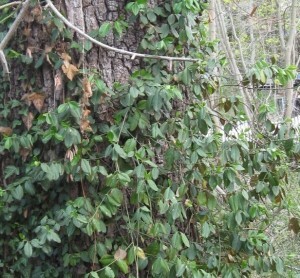 Then uproot, solarize and dispose of the rest yard waste collection. 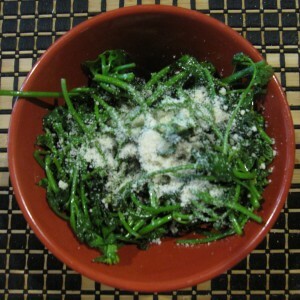 Collect a bag of the flowering stems with the tender leaves and even the seedpods for a delightfully pungent green vegetable side dish. 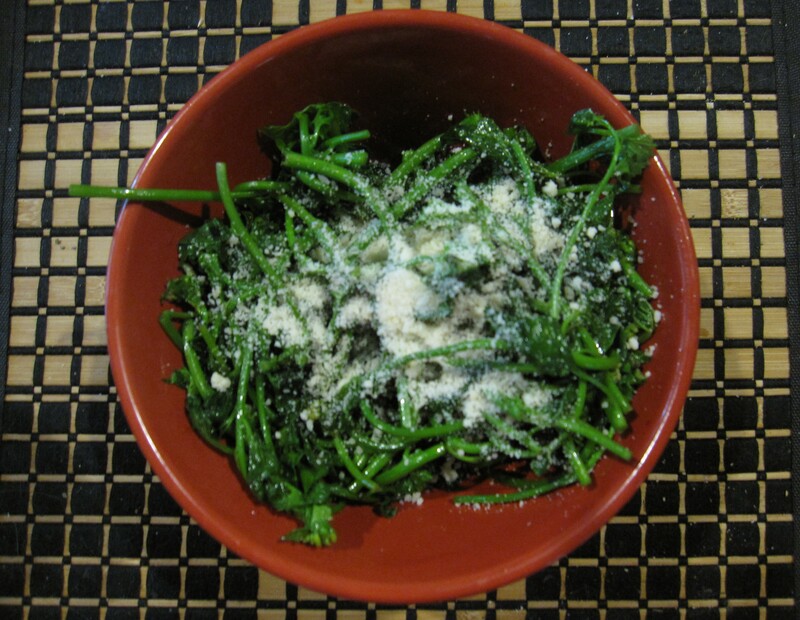 Saute and prepare as for broccoli rabe. 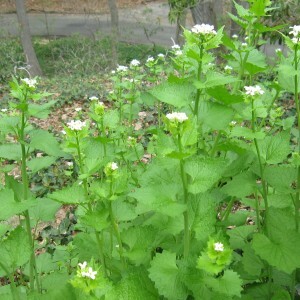 Garlic mustard also makes a tasty pesto. 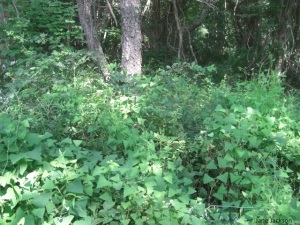 Japanese Knotweed This shrublike plant can grow to over 10 feet tall. The stems are smooth, stout and swollen at joints where the six inch leaves meet the stem. Leaves are oval to somewhat triangular and pointed at the tip. In mid summer, small white sprays of flowers are followed by small winged seeds. Juvenile plants can be hand pulled and should be done routinely throughout the growing season. Use a pulaski axe to remove the larger plants, including all roots and rhizomes. Any portions of the root system not removed will potentially re-sprout. All plant parts and seeds should be bagged, solarized and disposed of prevent them from reestablishing. 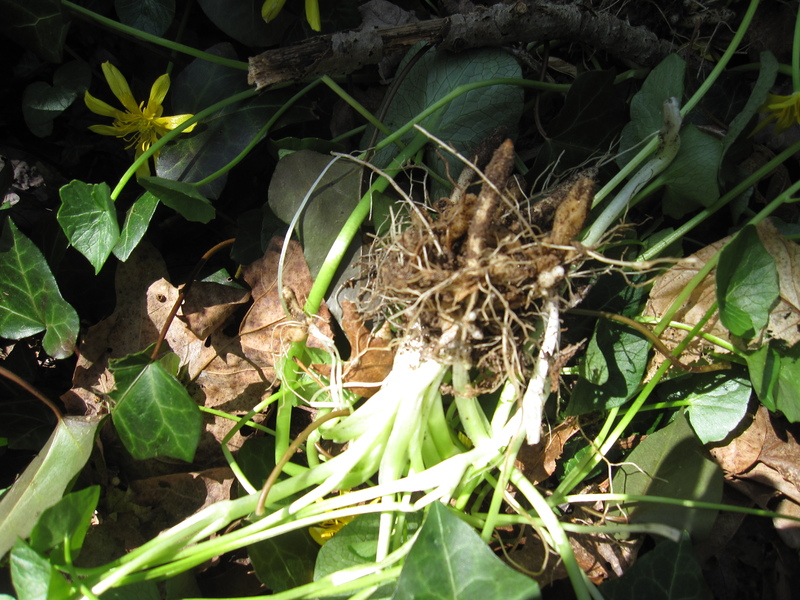 Click here for more information about uprooting herbaceous plants. 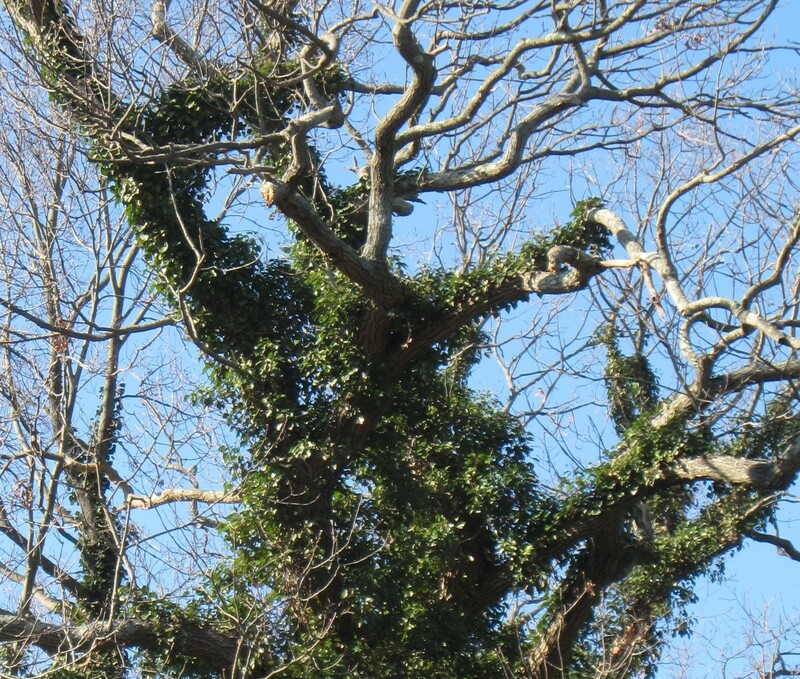 Many of the trees we see growing on Long Island are highly invasive and non-native — commonly Chinese exotics brought here over 200 years ago. Today, most Long Island soils harbor viable seeds dispersed from their descendants via wind, birds, or mammals years to decades ago. Under the right circumstances — often sun exposure when land is cleared — these seeds will germinate and grow to out-compete native species. Long Island’s invasive trees include the ubiquitous tree-of-heaven, Japanese angelica, Norway maple, and sycamore maple, plus some newcomers such as glossy buckthorn and Callery pear. Tree Control will address removing small seedlings and saplings — defined as young trees four inches or less in diameter at breast height. 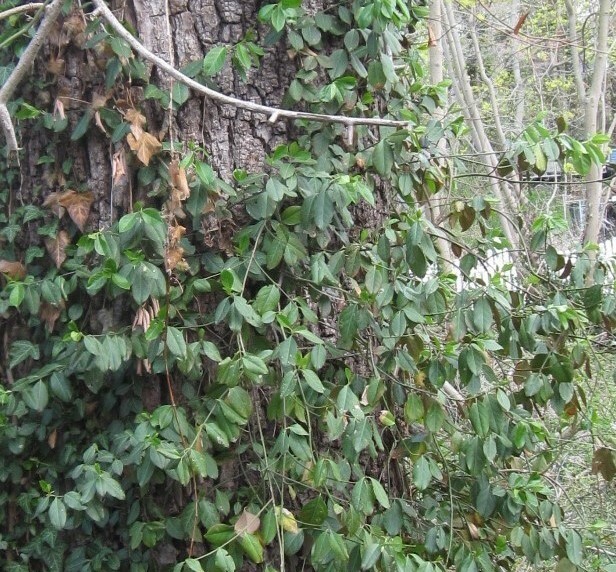 Larger tree removal may require a town permit and some trees may need treatment before cutting to prevent roots from sending out numerous sprouts. 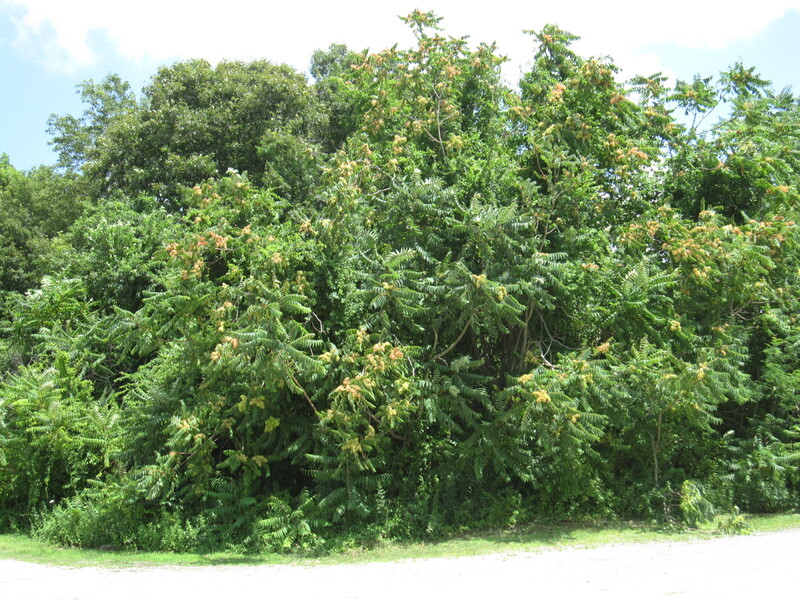 Ailanthus altissima, tree-of-Heaven aka tree from hell, is very invasive. 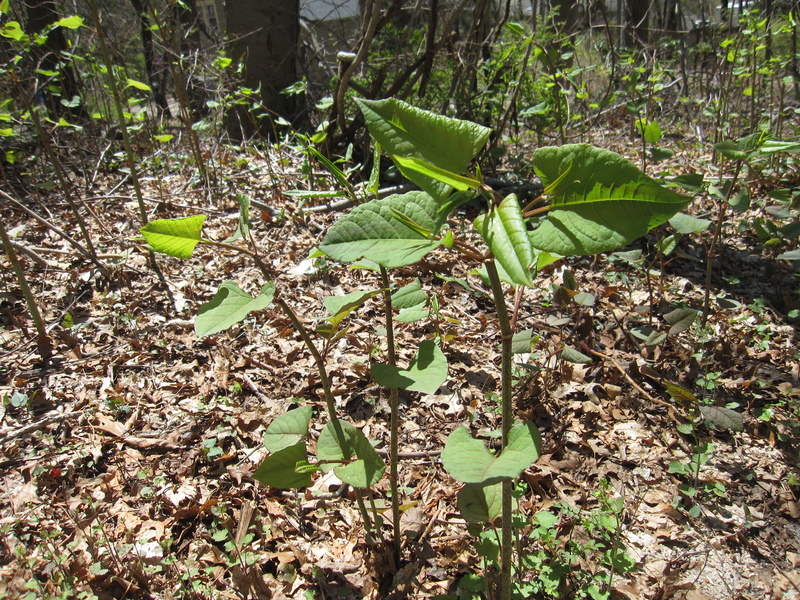 It is often confused in appearance with our native sumacs and black walnut. 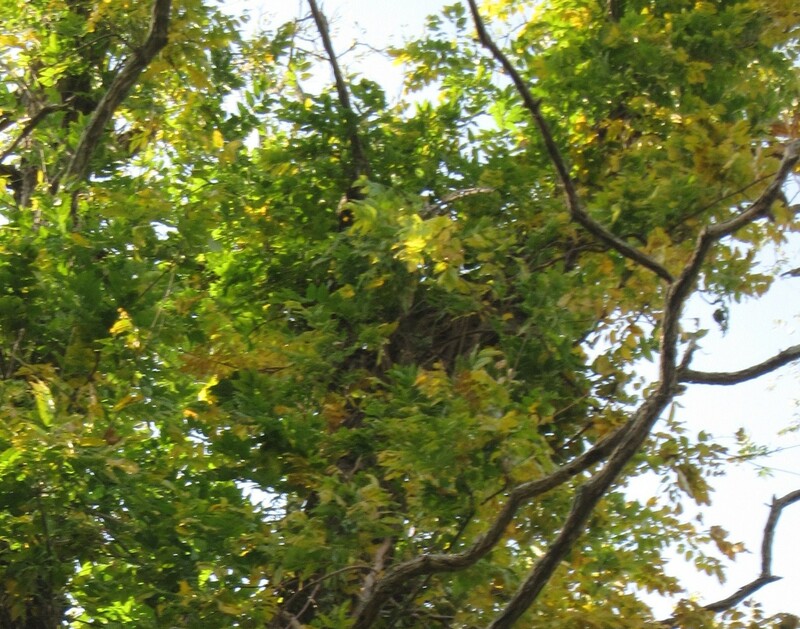 The trunk of tree-of-heaven is smooth (no ridges) and blotchy — resembling pig skin. However, the outstanding difference is the single “tooth” at the base on the otherwise smooth margin of the leaflets. Black walnut bark is deeply ridged and the leaflet margins are toothed. 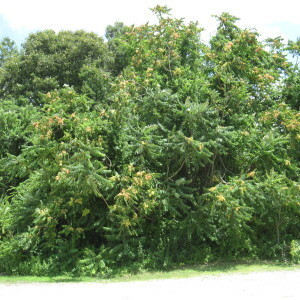 The tree-of-heaven is dioecious — meaning trees are either male or female. Annually, the females can produce 300,000 or more wind dispersed seeds, which deposit on open ground and germinate by the hundreds or thousands in large patches for great distances downwind of the trees. 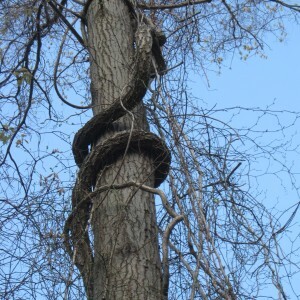 The female can be recognized by the feathery-looking seed stems that remain at the crown of the tree through the fall, winter, and early spring after the seed pods (samaras) have dropped. 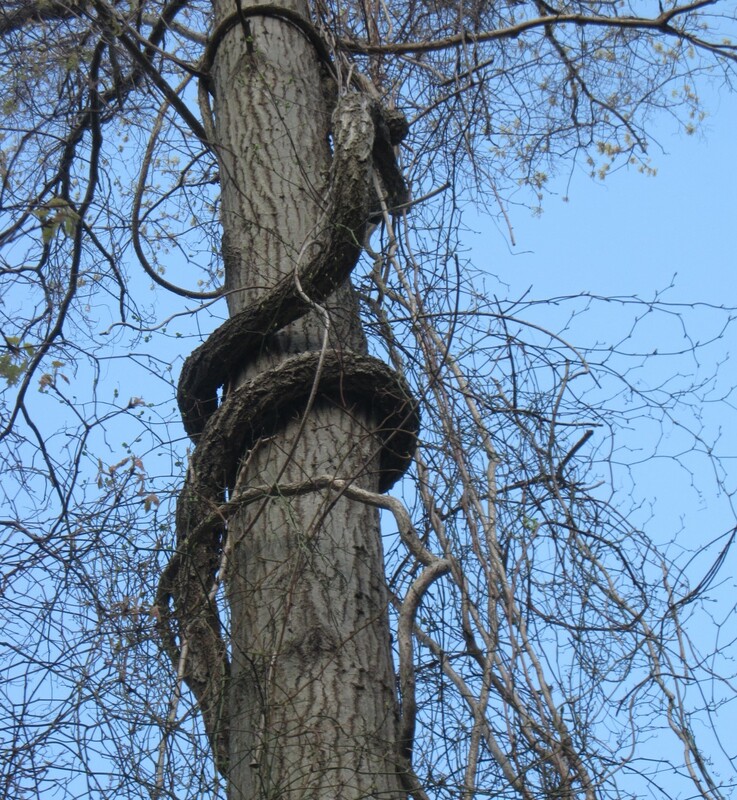 Since the tree aggressively sprouts when cut, the trunk is often girdled to kill it a year or so prior to cutting down. Click Tree Control for ideas on removing seedlings/saplings. 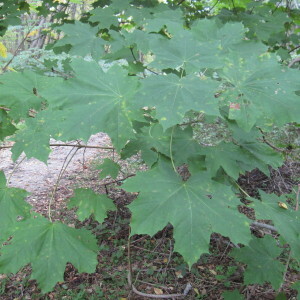 Acer platanoides or Norway maple is similar in appearance to sugar maple. 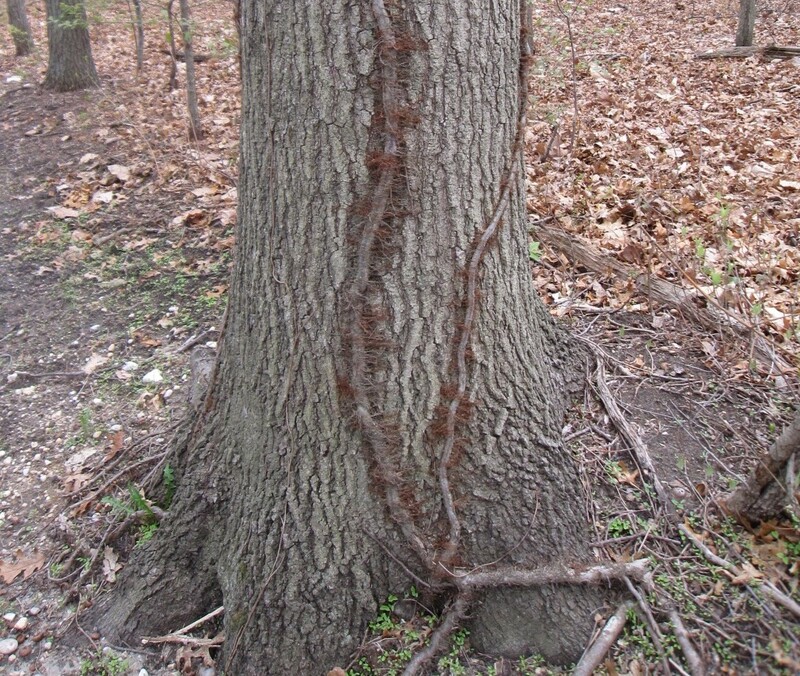 The easiest way to identify this tree is to break the leaf at the node where it joins the stem (petiole). You’ll notice white sap at the break, whereas saps from other maples are clear. 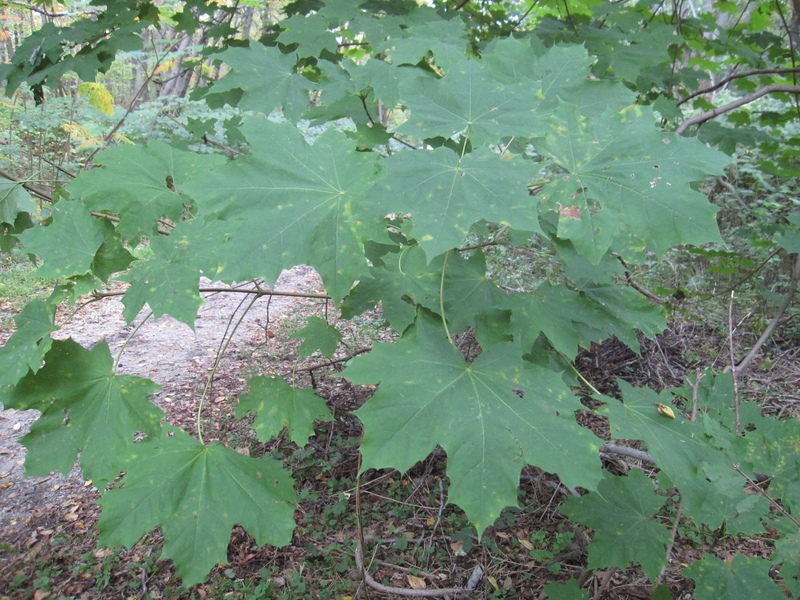 Also, the point tips on Norway maple leaves have fine “hairs”, while the tips on other maple leaves are rounded. The shallow roots of this species allow for simple removal of young trees and seedlings. See Tree Control.